DRT (Dena Recycling Technology) is a High-Speed Composting (Fermentation & Drying) System which can convert a batch of organic matter or waste into value-added products such as fertilizer/compost or animal feed within 2-24 hour. The base technology of DRT is to reproduce the natural circulation system in the machine for short time operation. The material such as organic waste, food processing waste and sludge are thrown into the reactor and is vacuumed to maintain a certain boiling point. 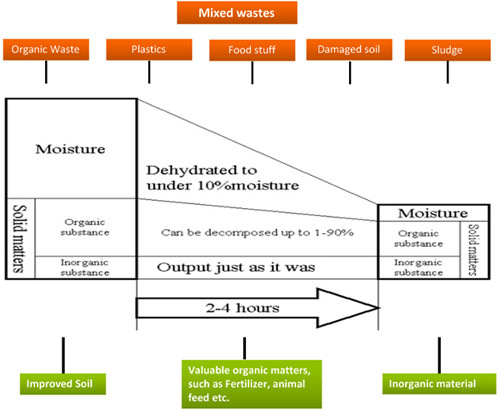 Thus an ideal condition for the high-speed composting is provided and the material is dehydrated in a short time. It can handle and process almost all types of organic waste.